ONE: Preheat oven to 350 ° F and grease a 9″ x 13″ well with butter or coconut oil. In a blender or food processor, blend banana and pumpkin puree until completely smooth. Transfer to a bowl and mix in eggs, agave syrup and vanilla extract until completely combined. TWO: In a separate bowl, sift together the coconut flour, baking soda, baking powder, salt and pumpkin pie spice. Once the dry ingredients are smooth and contain no clumps, slowly add them to the wet ingredients and stir until fully mixed. The mixture will be thick. THREE: Transfer the mixture into the greased pan and spread until smooth and even. 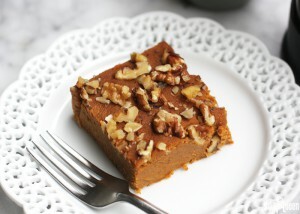 Gently press the chopped walnuts (if you’d like) into the pumpkin bars. Place the bars into the oven and allow to bake for about 40-45 minutes, or until the edges are golden and the center is firm. P.S. Jamisen’s verdict? “I love these because they taste sweet and taste like pumpkin pie.” If a four-year-old likes it, that bodes well for you and yours too. 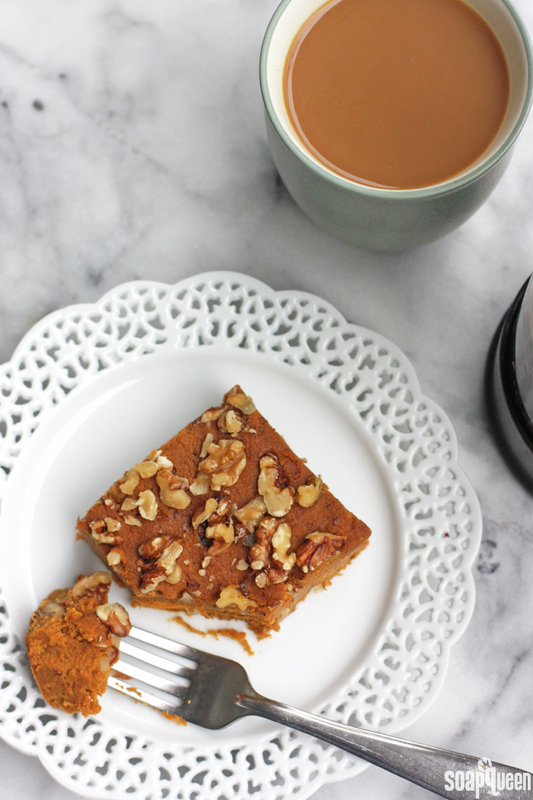 These gluten-free pumpkin bars are a great snack, or perfect for breakfast on the go! Preheat oven to 350 ° F and grease a 9″ x 13″ well with butter or coconut oil. In a blender or food processor, blend banana and pumpkin puree until completely smooth. Transfer to a bowl and mix in eggs and agave syrup until completely combined. In a separate bowl, sift together the coconut flour, baking soda, baking powder, salt and pumpkin pie spice. Once the dry ingredients are smooth and contain no clumps, slowly add them to the wet ingredients and stir until fully mixed. The mixture will be thick. Transfer the mixture into the greased pan and spread until smooth and even. Gently press the chopped walnuts (if you’d like) into the pumpkin bars. Place the bars into the oven and allow to bake for about 40-45 minutes, or until the edges are golden and the center is firm. I made these. There was way too much coconut flour. 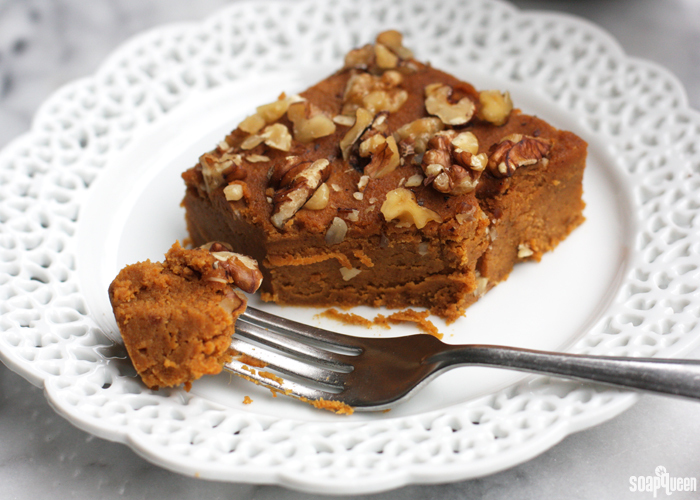 They are not like pumpkin pie and taste dry and crumbly…I followed recipe. Any ideas why not like a custard pie as photo? Yum! I have molasses I might use. Do you think this could be a good dessert for a party? Or is it better left as a breakfast food? Molasses would be yummy! It would give the bars a subtle smokiness. I did end up making these for my coworkers, with the molasses, and they loved it! Thanks for the recipe! I would also like to know what to use instead of agave syrup. Thanks for any help you can provide. Mmm, coconut flower and pumpkin = love it! Thanks for the recipe, we will certainly try it this week! 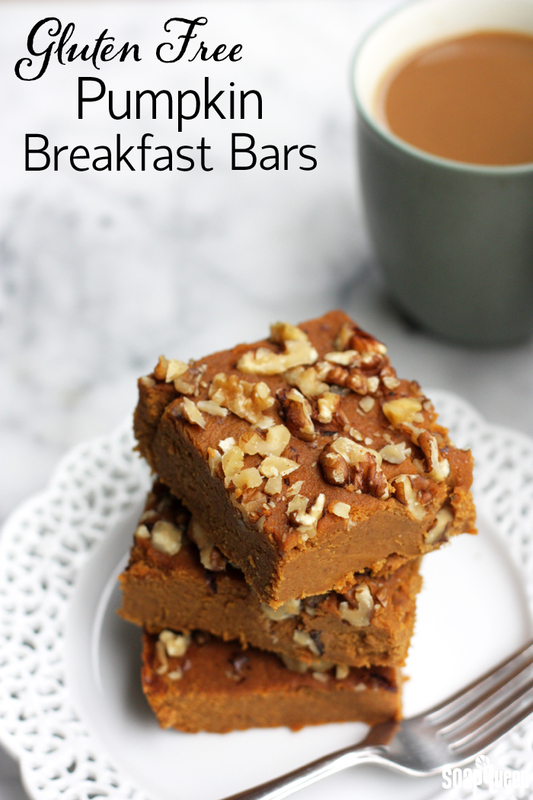 This looks and sound delicious…and I’ve been looking for something new for breakfast too! Question: What kind of substitutes would you recommend for Agave syrup?